When many of us think about losing weight, we think about what foods we shouldn't eat -- high calorie, high fat, sugary foods that can quickly add inches to our waistlines. But learning what foods to eat is just as important. Let's look at the foods we should be eating when we want to lose weight. Eating a variety of foods from different food groups will help you get all the nutrients your body needs. "You know, there are some foods that are super foods, very nutrient rich and ideal foods. And then there are foods that are really just about calories, and are kind of empty calories. " The best choices are foods low in calories but high in nutrients -- the ingredients our body needs to stay healthy. 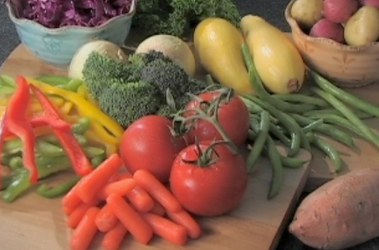 A good place to start is to eat more fruits and vegetables. Most people don't eat as much of these as they should. Eat more lean protein foods, such as fish, chicken, turkey, low fat dairy products, and beans. Choose more whole grain products. These unrefined foods give your body needed nutrients and fiber. Eat less sugar, white flour, soda and sweets because these processed, or refined foods, tend to be high in calories and low in nutrients. Eating less fat can help you lose weight. Everyone needs some fat, but fats are high in calories. In fact, they have over twice the calories than foods without fat. Choose healthier fats found in olive oil, canola oil, nuts, and fish. One way to start eating healthier foods is to plan meals ahead of time. Try working in something new and healthy each week, and then make it part of your regular eating habits. Eat a variety of nutritious foods that are low in calories. Choose your meats and fats wisely, and add whole-grain foods when you can. Pretty soon you'll be eating in a way that leads to permanent, weight loss success.